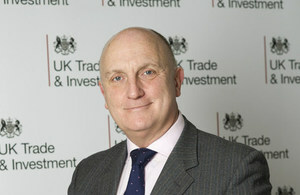 Mr Stephen Phipson, Head of the UK’s Defence and Security Organisation visited Japan from 4 to 6 November to seek Japanese Government and industry support for stronger defence industrial partnerships. The UK and Japan signed a Defence Equipment Cooperation Agreement in 2013. This led to the commencement of a number of Government run projects including personnel protection and air defence systems. This has inspired UK companies to seek broader industry led partnerships with likeminded Japanese companies in areas such as submarine optronics masts, sensors, flying training technology, helicopters, landing craft, air and maritime engine technology and cyber security. UK companies are also keen to develop partnerships with Japanese industry in the Security sector and to help with safety and security of the Tokyo’s 2020 Olympic and Paralympic Games. Phipson explained that his visit was not just about the UK trying to export to Japan. He wanted to develop truly joint industry projects which could lead to joint exports to third countries. He quoted the successful partnership between Kawasaki Heavy Industries and AgustaWestland on the MCH101 Mine Counter Measures helicopter as a good example. He mentioned that UK companies were also keen to be involved in Japan’s efforts to export submarine technology to Australia. As Japan develops its defence export capability; I’d like [Japan] to consider the opportunities for Japanese defence and security companies to expand into Europe through UK Inward Investment. The UK offers one of the lowest corporation tax levels and one of the easiest regulatory systems in the EU - making it very easy to do business. Japanese industry already has a strong track record of inward investment in the UK in the civil sector, for example through companies such as Fujitsu, Hitachi and Nissan. We’d like to work with Japanese defence inward investors when they are ready. To complete this picture of a fully two-way street of defence equipment cooperation, Phipson said he was keen to encourage Japanese industry to take an interest in exporting to the UK. He was particularly pleased to see such a strong Japanese industry presence at the Defence and Security Equipment International (DSEI) exhibition in September. He hoped that Japanese participation in Farnborough International Air Show next summer would be even stronger. In response to questions from JMOD and METI, Phipson explained how his Defence and Security Organisation is structured; how it operates, including support for Small and Medium Size defence and security companies; and the policy and mechanisms of EU and UK arms export controls. The UK Trade and Investment Defence and Security Organisation (DSO) helps the UK defence and security industries to export through direct exports and international partnerships. It does this by building strong relationships with industry and overseas governments. DSO provides specialist export advice and practical assistance, working closely with industry and government departments including the UK Ministry of Defence, the Home Office and the Export Control Office (ECO). DSO has around one hundred staff in London and around 20 diplomatic posts overseas including a First Secretary, Defence and Security at the British Embassy in Tokyo.